The map of GPCD by township is extremely helpful and confirms what I see on the ground. The GPCD in most cases mirrors the level of wealth in each township. I notice that several of the predominantly Chinese towns have no data- Did they opt out? How were the results tabulated? 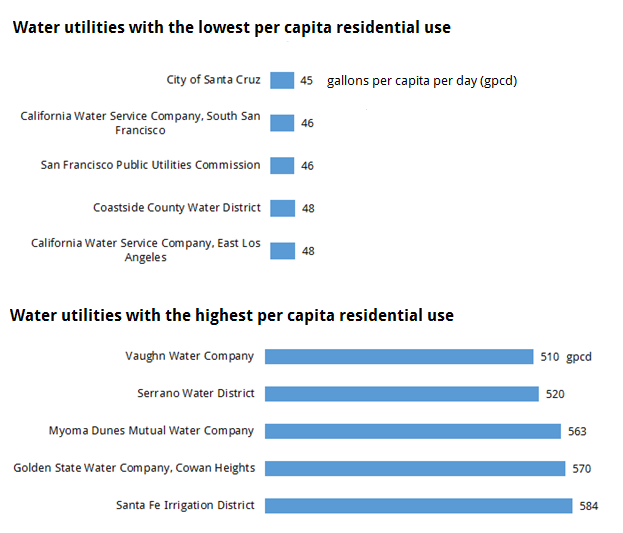 Total water use divided by population? Some areas showing a high GPCD have low populations but high crop density. This is hugely helpful and confirms the high use pockets. But some areas-such as the San Fernando Valley- are described as being FAR below the actual GPCD. They are even below the indoor only use norms for North America and Europe. So something was skewed far outside of actual. Some of your figures are misleading. People that get their water directly from a dam or storage tanks, like the City of Folsom and El Dorado County, can and should conserve water. Residents of the Sacramento area get their water from the Sacramento and American Rivers. They can’t save water. The water is already in the river, it’s going to the ocean, if they don’t use the water it is lost to the ocean. If they use the water outside their homes that water would begin to refill groundwater stores that have been depleted because of the extreme water restrictions. If they use the water inside their homes the water goes into the sewage treatment system and ends up back into the river. Use it or lose it people. The amount of water that is released from dams is NOT dependant upon how much is going to be used down river. Releases are entirely dependant upon the amount of water in storage and the time of year.